Video gamers immerse themselves in virtual worlds battling for power and competing for dominance, but even created universes are not without real-world racism. This month, an international Esports competition made headlines when a star player used a racial slur against his Chinese competitors. Audience members immediately reacted by calling for a ban on such language and the Chinese company that manages the game banned the word on Chinese servers, but the problem remains for those playing elsewhere. A screen shot of the game where one player made a racial slur in the text above. The incident occurred during the Dream League Season 10 Minor Tournament on Nov. 1, an international Esports competition where players from eight international teams competed in the popular game Dota 2. Andrei Ong, known as “Skem” of the CompLexity Gaming club based in the U.S., typed “ching chong” into the public chat channel barely a minute after beginning the first-round match with a Chinese club. According to John Jung, a professor of Delta State University in Mississippi, the phrase “ching chong” is considered a racial slur used against Chinese people for more than a century. It was originally used in the American West against Chinese Pacific Railway labourers in the mid-1800s. Ong later apologized on Twitter, but that was not enough for the U.S team. Kyle Bautista, the general manager of Complexity Gaming, said on Wednesday that Ong has been removed from the team permanently — a move that pleased some gamers. “People sometimes need to burn themselves to learn fire is powerful,” said Johan Sundstein, known as “n0tail” of OG club, a Dota 2 world-champion gamer. The C-word has been used in international gaming. It was also used by Carlo Palad, a professional Dota 2 player with the TNC Predator club based in the Philippines, on the same day as Ong’s comment appeared. Palad was referring to a member of the opposite team in a non-tournament game broadcast on the streaming site Twitch. This started a public back and forth with both sides blaming the other. Palad’s club tried to cover it up when the scandal leaked out. In a recently released WeChat conversation, the club’s manager said the reason Palad used the word was that an opposing team member used the C-word as his screen name. 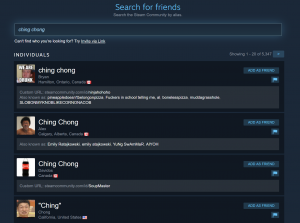 However, according to the game-distribution platform, Steam, the player didn’t change the name of his account to Ching Chong until one day after the match. The player has yet to apologize. In protest, several Chinese Dota 2 teams canceled their training schedules with Palad’s club, including the club PSG.LGD, the silver medallist of the highest-ranked competition for this game, TI8. Chen argues it is time for professional players to be more aware of their influence. “Their behaviour during a match, whether it is professional or just on a public server, can heavily influence fans, casual players, and aspiring professionals,” said Chen. The Dota 2 developer and tournament organizer Valve released a statement saying it “will not tolerate racist language between pro players in any form.” However, there was no mention of specific punishments for violators. Following these incidents, Chinese gamers protested, and Valve made an algorithmic change so that the word would be blocked if anyone typed it in the future. But this change was only made for those playing on Chinese servers. Now, some gamers who play Dota, one of the most popular video games in the world, are pushing for the company to do more. “This is stupid. Under what circumstances will Chinese players racially discriminate against each other?” said Gungnire. He initiated a collective boycott on Weibo, a Chinese social network, and Twitter consisting of thousands of Chinese Dota 2 players. They pledged to refrain from purchasing Valve’s games until stronger action was taken. 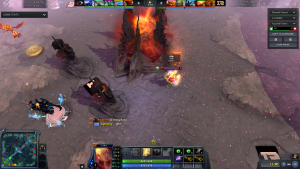 “If Valve decides not to take this seriously, not only will the incident become a meme and leave room for similar in the future, but the continued backlash from the Chinese Dota 2 community would only serve to feed a cycle of mistrust,” said Xiang Zheng, a Chinese streamer from Qingdao who studied previously in the United States. More than 5,000 Steam accounts contained the C-word as part of their player identification. He is a loyal Dota 2 player, but he’s frustrated that the C-word continues to be widely used in gaming. In fact, even after recent events, when information about the next Dota 2 Chongqing Major tournament was announced on Twitter, one in five replies contained the C-word, and more than 5,000 users had registered their Steam account with the C-word by Wednesday. Some non-Chinese players continue to use the language without being aware of the racial context. “We don’t even know what ‘ching chong’ stands for. We can’t understand each other every time hearing people speak Chinese in a pub game. It just sounds like ‘ching chong chang,’ and it’s fun to imitate them,” said Etuc, a frequent user of the C-word in Dota 2 and on Twitter. Chen says that is the problem, there need to be stricter regulations for electronic gaming, similar to those for traditional sports. “This China Dota 2 racism case illustrates Esports’ lack of institutions and structures, but as a private company Valve is not subject to the general consequences of bad press,” said Chen.